Learn highly inspiring wisdom teachings about Chinese medicine, 5 elements theory, meridians, deeply transformative meditations and mudras, learn the main basic yin poses with all their adaptations, adjustments to serve your students in all ways. Dive into yoga Nidra, learn about fascia and the yin anatomy and surrender to healing crystal bowls sessions to discover more about your own yin (unseen) qualities. Follow wisdom talks where the Chinese philosophy meets tantric buddhism and our modern pathways of awakening. This teacher training course will enable you to dive deeper into stillness, receptivity, openness, surrendering, relaxation, acceptance, to find balance within in a mainly yang style world. 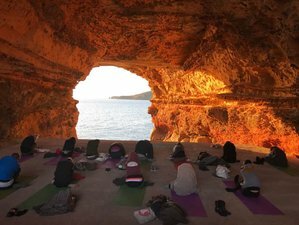 Rise & Shine Yoga offers their popular Yin yoga teacher training each month on Ibiza to students from all around the world. Yin yoga helps to land in a meditative state, helps to find stillness, peacefulness and balance...and often healing inside of ourselves. Stillness is so healing, so energizing, so wonderful. So join Rise & Shine for an inspiring Yin yoga teacher training on the high vibrational island of Ibiza. You can take this course as a teacher, or even as a practitioner to deepen your own practice. You will be nourished by two daily practices (mainly yin and some yin-yang) , meditations, crystal bowl sound baths, amazing energy on a magical island, and our super yummy vegan healthy meals from our dear chef. The trainees usually leave recharged, empowered and balanced, and confident in teaching Yin yoga to their students. You will learn how to create a Yin class, long or short for a group, for an individual session, or for yourself. You will learn transition poses and intelligent ways of sequencing - taking in consideration pose families, anatomical guidelines, adaptations and adjustments to individual needs, and you will dive deep into 5 elements and meridian therapy. You will be enabled to work with groups of students and on one-on-one with clients with specific needs, complaints, and anatomical constitution, and you will be able to use simple Chinese medicine wisdom to create an emotional and physical and mental balance for yourself and for your students. You can choose the onsite accommodation in the beautiful Villa near Santa Eularia, and 5 minutes from the beach. In a really nice, calm and peaceful setting. The beautiful rooms are available in double or single occupancy. The villa has a private pool that you can use during the free time, a huge garden and a roof terrace. If you are local, you can also choose an offsite accommodation with Rise & Shine Yoga's suggestion or on your own and join the training every day in the morning. This Yin yoga teacher training will enable you to create the "Yin space" - a space of compassion, acceptance, nourishment. You will get skilled in creating/awakening/discovering the YIN quality and energy within yourself - so it can enrich and balance your life, and so you will be able to offer it to others. The peaceful, compassionate allowing presence that heals all imbalances by just "being with it". You will learn how to allow yourself to feel emotions, intensity, to reopen shut down senses, and then to able to let all the sensations and emotions (emotion means energy in motion) flow and go instead of diving into the story of it and holding onto them. Get deeper into Self Love and deep listening. This course is a deeply transformative healing journey, as only by healing and loving yourself first then you can offer these qualities to other, by going trough the experience instead of just talking about the theories of it. There will be a lot of focus on your personal experience and opening up to senses, listening, and landing in your true nature. Yin yoga has a deeply healing effect. And even tough every person is different, every story is different, and a healing process requires not only the realizations of the patterns and underlying emotional memories and tensions behind every disease but also new conscious choices about your life, you can acknowledge that with appropriate sequences you can rebalance major imbalances in the body with regular Yin practice. The body imbalances such as allergies, digestive, hormonal problems, back problems, mental problems, blood pressure problems, anxiety symptoms, emotional blockages, and lack of energy, and the emotional disorders such as lack of determination, trust and confidence, anger problems, depression, fears can all be nurtured by appropriate Yin practice with great results. Eventually, it can transform your life into a more loving, more still, more attentive and caring, enjoyable journey, than the fast-paced western pattern. This training gives 60hrs credit with Yoga Alliance, as 55 contact hours and 5 hours self- study, reading work, practice, and specific assignments. The daily schedule can change according to the season and the needs of the group. You start the retreat on the first day at 17:00pm and it ends on the last day at 10:00am. You will visit magical power spots on the island, where sacred empowering ceremonies will be practiced. Enjoy wonderful sessions at sunrise and sunset. The packages with accommodation includes daily three vegan meals. If you are staying offsite, the meals can be provided at 190 EUR, including breakfast buffet, 2 course organic vegan/vegetarian lunch and dinner, snacks and tea , water and coffee during the day. Every afternoon, there will be free time for your beach, or pool chilling, reading, study and contemplation activities. Diverse delicious massages available on request and at extra cost.